The z-order determines the order in which objects are drawn on the canvas. Those object with high z-order are drawn last and therefore drawn on top of objects with lower z-order. The order is determined by the order that the objects are listed in the SVG file. 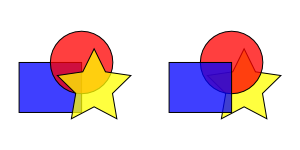 The yellow star has the highest z-order on the left but the lowest on the right. Inkscape has a number of commands to change z-order. The commands are available from the Menu and via Keyboard Shortcuts. They are also available in the Tool Controls when the Select Tool is active. Object → Raise (Page Up): Move selected object(s) up one step. Object → Lower (Page Down): Move selected object(s) down one step. Object → Raise to Top (Home): Move selected object(s) to top. Object → Lower to Bottom (End): Move selected object(s) to bottom. The XML Editor dialog can also be used to change z-order. There is also a Restack extension that can reorder arrays of objects.